Highly Commended, non-fiction category, 2017 ACT Writing and Publishing Awards: Taking Flight. Winner, non-fiction category, 2015 ACT Writing and Publishing Award: Australia’s Few and the Battle of Britain. RAAF Chief of Air Force's 2015 reading list: Australia's Few and the Battle of Britain . Highly Commended, non-fiction category, 2014 ACT Writing and Publishing Awards: Australian Eagles. RAAF Chief of Air Force's 2010 reading list: Jack Davenport Beaufighter Leader. Winner, Military Historial Society of Australia's 2013 Sabretache Writers Prize: ‘Miss Celia Macdonald of the Isles “who has been a particularly good friend”’. 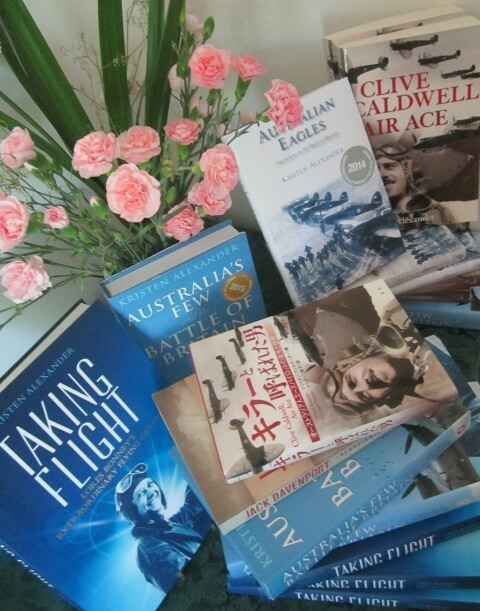 Winner, Military Historical Society of Australia’s 2012 Sabretache Writers Prize: ‘Australian Knights of the Air and their Little Touches of Chivalry’. 'Stalag Luft III: the last Christmas of the War, December 1944', Barbed Wire and Bamboo: Official Organ Ex-prisoners of War Association of Australia, Volume 69, No. 6, December 2017. 'One of the Few' (John Crossman), Flightpath, Vol. 28, No. 3, February-April 2017 (with Andy Wright). 'Lores Bonney: A woman of achievement', Queensland History Journal, Col. 23, No. 4, February 2017. 'Lores Bonney: A Remarkable Woman', The National Library Magazine, March 2016.